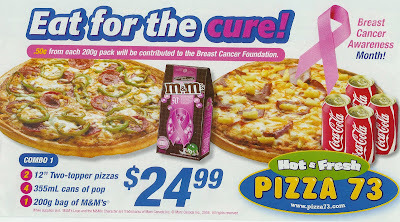 Weighty Matters: Eating Pizza, Coke and M&Ms Cures Breast Cancer! Thanks to loyal Albertan blog reader Kristine for sending in this ad she received in her mail from the do-gooders over at Pizza 73. Yup - there's a plan. Eat a ridiculously high calorie meal and a whole 50 cents will be donated to breast cancer research. I suppose you might argue that given that obesity raises your risk of breast cancer and high calorie meals raise your risk of obesity that buying this combo helps to stack your deck?